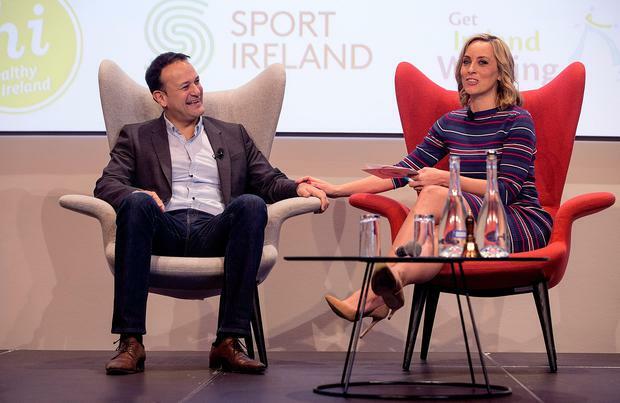 Former schoolmates TV presenter Kathryn Thomas and Taoiseach Leo Varadkar were on hand yesterday to launch a new initiative that aims to encourage people to make positive choices to improve their physical and mental health. The Healthy Ireland 2018 campaign provides support and information to help people make healthier choices to get active. Mr Varadkar said it was important to recognise the progress people are making to improve their health, but said more needs to be done. "Fewer people are smoking now than used to smoke in the past, and we are more aware of our mental health and people are getting more exercise. "That is not to say we don't have huge problems when it comes to obesity, people smoking and drinking too much, not getting enough activity - all of those things." He said there are small lifestyle changes people can make and that he has incorporated in his own daily routine, that bring huge benefits. "All of us have gone through attempts to dramatically change our lives suddenly, lose loads of weight or get fit really quickly - but even if you achieve that, you tend to slip backwards really quickly. "Often the most effective thing is to make small changes. Part of our campaign is to make people aware of the importance of keeping active, taking the stairs instead of the elevator, paying more attention to mental health, and something that I have started doing, turning off the phone during meals - it not only makes the meal more pleasant and your interaction with people more pleasant, it is actually good for your headspace. "We also want to encourage people to eat more vegetables and drink more water." The Healthy Ireland initiative, launched yesterday in conjunction with RTE's Operation Transformation, aims to increase the number of people healthy at all stages of their life, reduce health inequalities and protect the public from threats to health and wellbeing. The scheme will work to create an environment in which every individual and sector of society can play a part in achieving a healthy country. Mr Varadkar says he incorporates exercise into his routine as much as possible. This led to him being seen running with his Canadian counterpart, Justin Trudeau, last year. "We did a run in Phoenix Park during the year - and I think he was probably a bit faster than me, which is a little bit annoying, because he's older than me as well," said Mr Varadkar. "I try to get proper exercise four times a week. Sometimes it is first thing before I go to work. I have the advantage of having a shower in work and tax incentives are kicking in this year for employers to put showering facilities and equipment into the workplace. "Unfortunately it does mean you get photographed on the rare occasion in the darkness of a moving car, travelling in your gym gear."